Jeanne-Marie has been waiting to go on a fishing trip with me for quite some time. We finally had the chance to go and she invited her older sister, Elizabeth-Kay to come along with us. It turned out to be a great day and we caught three fish in about four hours. 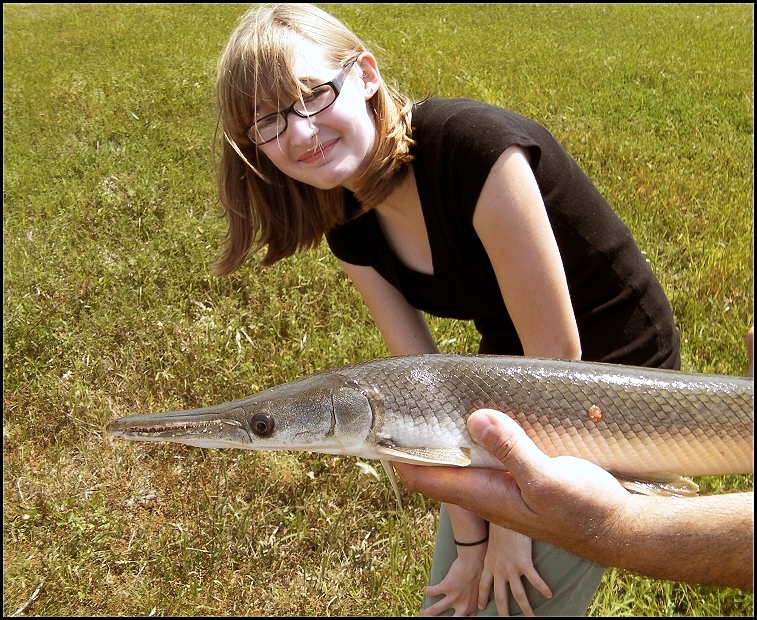 This picture to the left is an alligator gar that EK caught while trying to reel in a crab on her line. This is a baby gar and we sent him back into the lake after taking this photo. Below are the two other fish we caught. 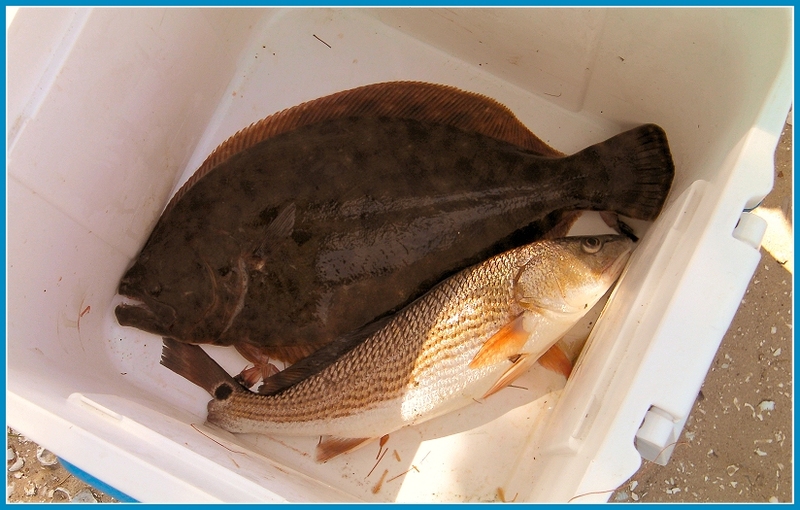 The flounder was a nice size about 17″ long and the Red fish was 16″. Both of them are good eating and we would like to thank them both for their contributions to our family diet by offering up themselves to our oven and grill. There were beau coup boats coming in and out of the harbor channel where we were fishing disrupting the water. Also, when gar fish are around other species tend to run off as well. So we were glad to have caught these fine specimens and look forward to more excursions in the near future. ~ by ostrakinos on April 19, 2010. Cool gar! Last weekend I caught my first alligator gar. We were camping and went to sleep with three lines in the river. When we got up there were only two. I started reeling one in and it caught the fishing pole that disapeared. After I got it back to the bank I started reeling it in and something big jumped almost completely out of the water! After a nice fight, I finally got a 4′ alligator gar to the bank. When my fishing partner tried to pull him up by the line, the hook slipped out of his mouth. He laid there for 5-10 minutes before he caught his breath and swam away. We had time to take a picture at least. Hey Eddie, thanks for answering my questions. You have no idea what it meant to me.